Sierra de Grazalema Natural Park is one of Andalucia’s most visited parks, renowned for its wildlife, rugged limestone landscape and great hiking territory. Offering a more gentle walking experience amid centuries-old cork oak woodland is the Alcornocales Natural Park. 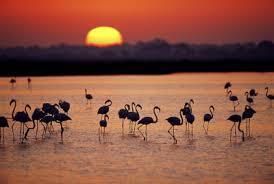 Located in a prime spot for viewing the twice-yearly migration of birds between Europe and Africa, Cadiz has many sites brimming with birdlife like the province’s two largest protected coastal zones, the Estrecho Natural Park and the Bahía de Cádiz Natural Park, which has one of Europe’s most important wetlands. Despite the many built-up areas littering its shoreline, Cadiz is rich in outstanding coastal features like the natural monuments of the Tombolo de Trafalgar, Corrales de Rota, Duna de Bolonia and the Punta del Boquerón.